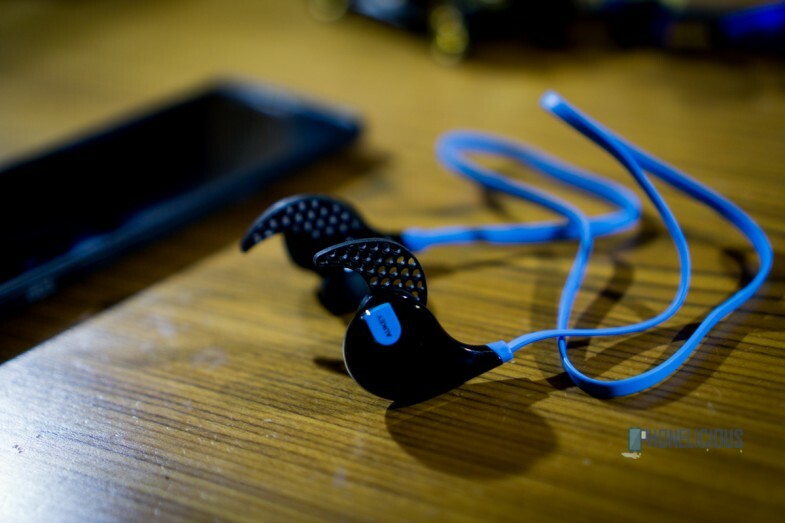 I have been using the Skullcandy Chops for over 2 years while I go for a jog or at my gym. For the price I paid, the Skullcandy over-lived its life and finally the earpiece came off. I glued it back with Superglue and it still works, but then I thought I must retire the Skullcandy Chops and get a wireless headset. When it comes to wireless headsets, there are many options. I started with the JayBird X2, but then finally decided to get the Aukey Sports Bluetooth headset. I didn’t want to spend too much on the headset, because I know about my carefulness. While looking economic option, the Aukey Headset kept surfacing in the search results and it had some good reviews on Amazon. So I got it and here is what I think of it. Aukey is a chinese company and they have a strong presence in the US. I recently got a Quick Charge 2.0 Car Charger from Aukey and was really happy with it. So for the Bluetooth headset here is my problem statement. It must be small, but not so tiny. It must be tough to loose and easy to find. It must not cut out the ambient sound, because my usual circuit is urban and I must be aware of my ambiance. Having established that, lets see if the Aukey Bluetooth Headset would meet my needs. The Aukey Bluetooth headset comes in a small eco-friendly box. It has a velvet pouch to store the headsets. There are 3 sets of in-ear earbuds in different sizes. Also there are 2 type of earhooks, in 3 different sizes each. After trying out the earhooks, I found my best fit after 2-3 trials, which is the shark fin ear-hook of medium size. Its a bluetooth device and it has to be charged. There is a small charging cable provided along, but you can use any Android phone’s micro usb charger. The headset is a bit bulky in terms of size. But it light weight and is made of plastic. The plastic does not feel premium, but you get what you pay for. Wearing the headsets, it does not snugly fit in with your face and it sort of hangs out of the ears but with the ear hooks secured to the ears, these headsets managed to stay on and never fall off. The right side has the power and volume buttons along with the mic. Yes, it has a mic to answer calls. The left has the micro USB socket to charge, but the charging indicator light is on the right. 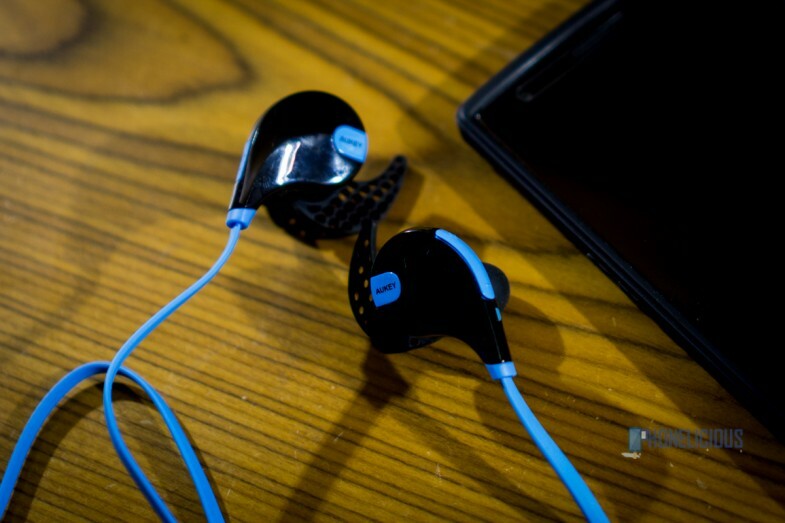 The wire between the two ear pieces are not too long and it flat for a tangle free experience. It comes in bright colors and choose the blue color. 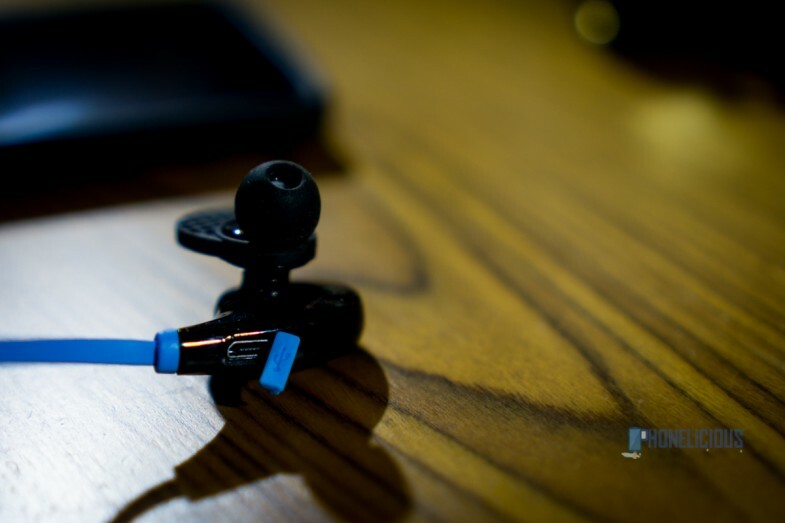 The wires and the accents are blue while the rest of the earpiece is shiny black. Pairing is also simple and fast. Once paired, everytime your power it up, it auto pairs with the mobile if the bluetooth is on. It can be paired with 2 devices at the same time. In terms of audio quality, it is pretty decent. The voice clarity is noteworthy. The bass isn’t heavy and the treble is not rich. I tried with different equalizer setting and then finally settled for a setting that gave out the best sound from this pair of headsets. I need this headphone to listen to music for 30 min in a day and the quality of sound from the headset was more than what I ask for. But if you are too picky about the quality of sound, stay out. The voice clarity was very clear for mobile calls as well. For 25$, its a deal worth a try and I would definitely recommend it.